Russia is witnessing the revival of Rodina, whose members consider themselves Putin’s “black-ops”. In early June, the conservative party Rodina, whose unofficial leader heads the national defense industry, held a congress at a location outside Moscow. Disbanded in 2006, the party is today enjoying a revival. Political analysts say that Rodina, which means "Homeland" in Russian, may be able to carve out an anti-United Russia, pro-Putin niche for itself in the future. Rodina’s congress was held at the Museum of Military Hardware, where guests were met by an orchestra performing military marches. Delegates came dressed in military uniform, even though most are not military personnel. The party leadership had decided that such an appearance would make its activists look more imposing. The party, which has a rich history, is now experiencing a revival. In the middle of the last decade, its then leader and now deputy prime minister in charge of the Russian defense industry, Dmitry Rogozin, was considered a favorite of President Vladimir Putin. In 2003, the moderate nationalist Rogozin and his party (at that time an electoral bloc that only later transformed into a party) won seats in the State Duma. However, what brought Rogozin to prominence — namely his nationalism — was also his undoing. In 2005, during elections to the Moscow City Duma, Rogozin crossed a line: His party launched a provocative TV clip entitled, "Clean our city of garbage," in which the Rodina leader promised to clear Moscow of migrant workers from the Southern Caucasus and Central Asia. The party was immediately barred from the elections, and, as noted by analysts, the Kremlin began to squeeze Rogozin out of the State Duma and Russian domestic politics. Rodina ceased to exist in 2006. Along with two other parties, it became part of the center left of the A Just Russia party, which was headed by former speaker of the upper house of the Russian parliament, Sergei Mironov. As for Rogozin himself, he was appointed as Russia’s permanent representative to NATO in 2008. In 2011, the decision was made to restore the party. Analysts contend that the views of Putin and the Russian elite have become much more conservative since 2005. In the midst of the Moscow rallies and protests against the results of the State Duma elections in December 2011, Putin recalled Rogozin from Brussels and appointed him deputy prime minister in charge of the country's defense industry. In 2012, on December 21 (which happens to be Rogozin's birthday), the Ministry of Justice registered the reanimated Rodina as a political party. Today, Rodina's political allegiance lies firmly with Putin. "Our program is all seven of the pre-election pledges made by Russian President Vladimir Putin. They are Putin's seven strikes. The seven articles in the manifesto set out the national strategy of Russia, which we fully share and support," the party's official leader, Alexander Zhuravev, said at the June congress. "I am confident that the party will soon be able to start realizing the president's program," said Zhuravev. "Rodina is the president's black-ops force. Every patriot must support the government. Putin's political course is designed to strengthen Russia." Zhuravev explained the military garb worn by delegates: "The militarization of our congress is entirely justified. Many liberal-minded citizens believe that Russia is not the country it was in the days of the all-conquering czars and the Soviet Union. We categorically disagree." Rogozin also addressed the delegates. Before his speech, he presented the party leadership with a nickel-plated replica of a Kalashnikov assault rifle — the renowned AK-47. The speech given by the deputy prime minister at the congress was closed to reporters. However, Zhuravev conveyed the essence of Rogozin’s speech — namely that "the president's special forces will be very dangerous for the enemies of Russia." Political analysts believe that, as the informal leader of Rodina, Rogozin is looking to retain the national-patriotic niche. Mikhail Vinogradov, political analyst and resident of the St. Petersburg Politics Foundation, believes that, although the deputy prime minister has yet to frame his future plans, he does not want to miss the opportunity to continue his career as a party leader. 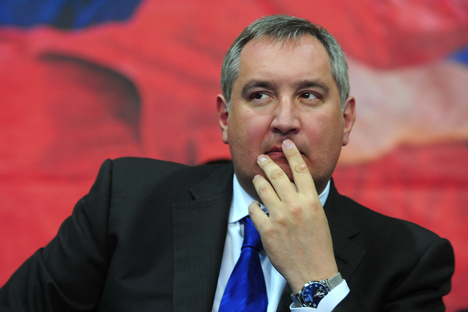 "Rogozin has acted very judiciously. He has shown that it is his project, without making any vociferous statements or attracting too much attention," says Yevgeny Minchenko, director of the International Institute for Political Expertise. According to Minchenko, following Rogozin's appointment to the government, many of his colleagues took issue with the new deputy prime minister's excessive political activity as head of the defense industry. After that, "Rogozin seemingly resolved to minimize his public activity." Nevertheless, it is too early to speak about the party's prospects. Although Rodina's leaders assert that they are ready to fight for seats in the regional parliaments this September, political analysts are skeptical about their actual chances. "They are unlikely to come out guns blazing in the September elections, but, as a project for the future, it could be interesting," says Minchenko. Vinogradov, meanwhile, suggests that the party will find support among voters who are inclined to oppose the ruling United Russia party but approve of Putin's policies.